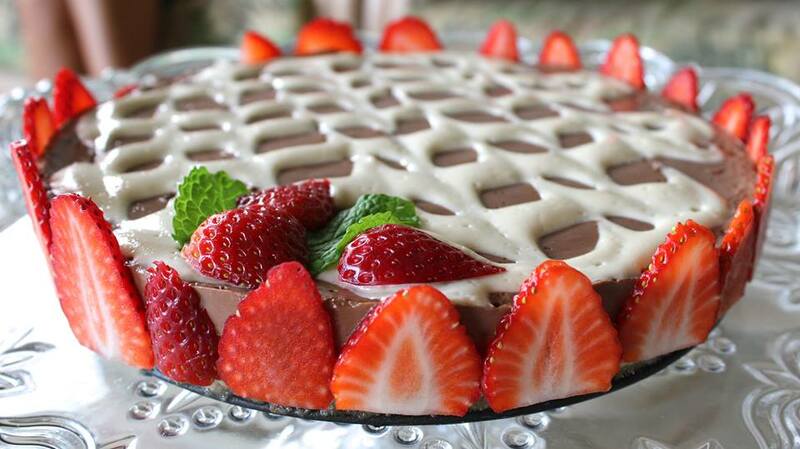 Cacao Cream Pie with Strawberries - Raw Vegan Deliciousness! 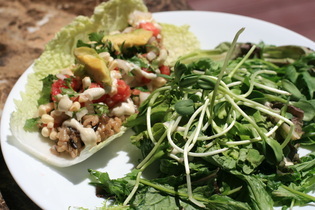 Yummy Green Burrito with kale, black beans, sunflower sprouts, tomatoes and tahini sauce. Creamy Vegetable Soup, Green Papaya Salad, Crudite', spring rolls, and Asain cabbage salad. Nori Rolls in the Making. 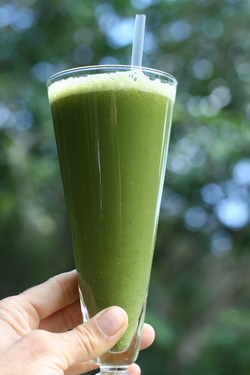 Super Green Elixir… Kale, Cucumber, Ginger, Apple, Burdock, Bliss. Berry Citrus Cheesecake Pie… Almost Gone. Indian Dahl with Green Papaya and Spinach Sprout Salad. Sprouted Almond Hummus, Naan Bread and Fresh Organic Tossed Salad. Chocolate Cream Pie in the Making… Mmmmmm. Rainbow Beet Summer Rolls with Tamarind Dipping Sauce. Carob Pudding for the Kids. 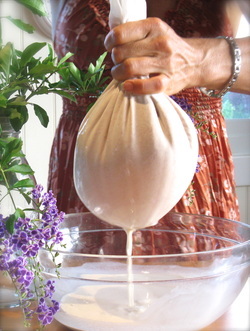 Making Fresh Sprouted Almond Milk. 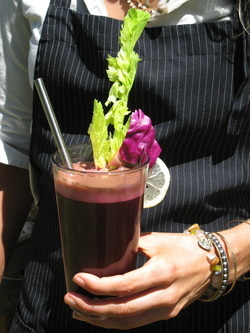 Delicious Fresh Blood Building Veggie Elixir. Fresh Golden Zucchini Pasta with Sun Dried Tomato Marinara Sauce and Fresh Herbs. Raw breads and crackers are incredible. They really help boost the health into my family's life! Zucchini angel hair pasta, with home made pesto, tomatoes, etc. Blueberry smoothie with greens and fresh ground flax seeds, sweetened with frozen grapes! Yum... I like Mexican food! So fun to play in the kitchen... with foods that protect our families, flavors that nourish the taste-buds and soul. Refreshing and sweet, this apple ginger mint is light, and perfect to tame that sweet tooth after a meal. with chocolate shavings on top. 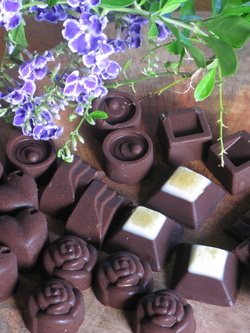 These are sweet, rich almond milk with food grade peppermint essential oil... perfect treat for those hot summer days. Rich, smooth and velvety. A decadent dessert you can eat guilt free - go ahead, have another piece. Making whole spelt tortillas with my munchkin for dinner... Koa is such a good helper. Celebrating love with this cashew cacao cream base; sweetened with maple syrup, thickened with agar agar seaweed. 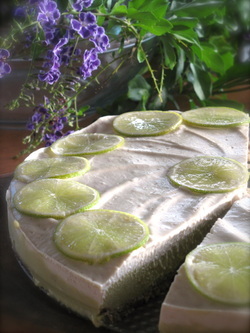 with raw carob drizzle... frozen bananas and vanilla metamorphosised into an ice cream pie! Crispy, crunchy, good for your prostate. 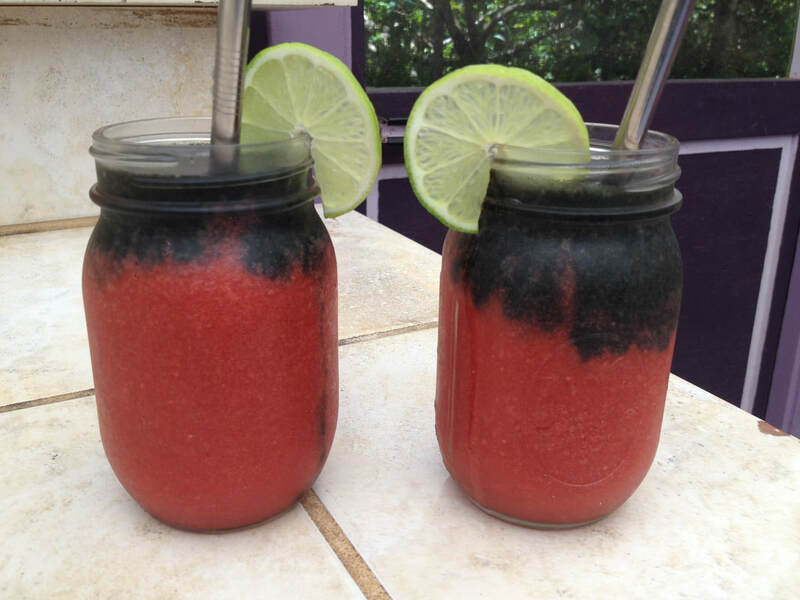 Limeade with passion fruit and starfruit... strawberry guavas for garnish and treat at the bottom of the cup. Sunflower seeds, sun dried tomatoes, and chilli powder combine to make re-fried beans. Collard leaves for tortillas. Oil free, bananas, oats, raisins, sunflower seeds come together in a healthy snack that is super tasty too! Picnic lunch after a wild edible herb waterfall hike - yum! Baby greens with fresh herb salad, cashew dill ranch dressing, fresh green juice, spring rolls, avocado, sun dried pineapple, figs, and almonds, and raw cacao cream pie for dessert. 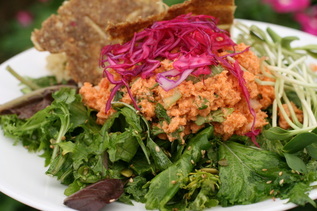 Mock Tuna Salad and Flax Onion Bread over a bed of Organic Baby Greens. Lemongrass Goji Truffles and Fresh Mango Passion Fruit Ice Cream. Fresh Made Maca and Cacao Ice Cream! So nice on a hot summers day. Green Veggie & Black Bean Burrito with Spicy Jalapeño Cashew Cheese and Side Salad. Asian Veggies over Brown Rice, Sweet & Spicy Purple Cabbage Salad. Mexican Tostada with Chipotle Cashew Cheese and Organic Salad. Sprouted Sunflower Seed Cheese with Almond Flax Thins, Fresh Herbed Kale Salad and Basmati Rice Pilaf. Green Soft Tacos with Spicy Jalapeño Cashew Cheese. Thai Coconut Curry and Vegetables with Cucumber Spinach Salad. Zucchini Pasta Marinara over a bed of organic baby greens. Sometimes the best dishes are ones with less than 4 ingredients. Strawberry cheesecake, vegan and delicious! 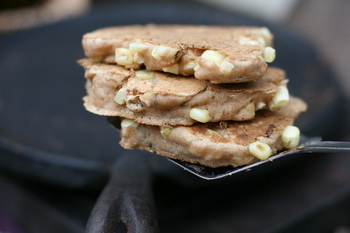 Sprouted buckwheat flax cracker with guacamole, tomato, and sprouts. Simple, delicious and nutritious! 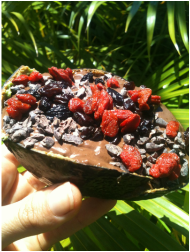 Cancer fighting, health protecting nutrients - and delicious! I'll eat salad instead of vitamin pills any day! Designing the top with a cashew swirl. 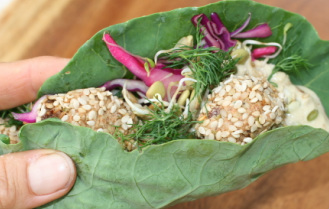 So many ways to make nori rolls... these are cashew carrot pate' with massaged kale and cabbage salad. - yum! 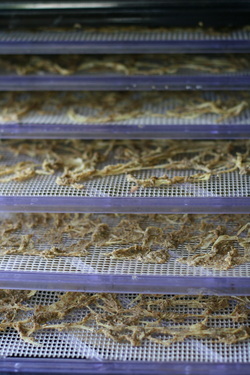 Light and crispy... almost like potato chips, but choke full of omega 3's and beta carotene... my kind of food. Ice cream made out of frozen bananas and vanilla. Cacao drizzle over top to decorate. Fresh picked Papaya and Starfruit with a squeeze of tahitian lime. 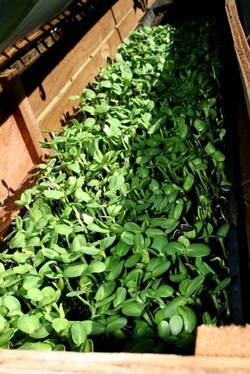 Can't beat the health of fresh sunflower sprouts! I make pesto without extra oil... lighter, healthier, tastier. Fresh lentil sprouts, purple cabbage, kale, jicama, fresh herbs... So fun to eat many different salads this way! Wow... starfruit just picked from the tree, juiced and accentuated with a touch of lime. Tahini yogurt sauce with a hint of cumin wrapped up with fresh dill and raw veggie falafels. Satisfying. Cashew coconut frosting over double layered carob cake. I wish I could offer sample bites through the internet! So much better than ice cream, and it is good for you too! My type of green burrito... easy on the digestive system. So full of flavor and nutrients! - get ready to throw that medication away! Tiny bite sized popsicles! Kids go crazy for these! Me too! So simple, tasty, and full of health! Frozen bananas and dates make this pie so healthy you can eat it for breakfast every day. Don't forget to play with your food! - This flax, lime, oat facial offers gentle exfoliation while nourishing the skin at the same time. The fresh lime juice cleanses and invigorates. Gently massage in a circular motion, let dry, then rinse off with fresh cool water. eaten right out of the avo skin! Indian Mulberry aka Noni... place the clean fruits in a glass jar with a lid and leave them out in the sun. When the liquid gathers, pour it off and drink it. Noni is good for skin as well as internally. and oh so delicious! ... the kids line up again for seconds, 3rds, 4ths. Almond butter bliss balls with cacao - yum! This cookbook is perfect for those transitioning from a meat or dairy based diet into a vegan diet. 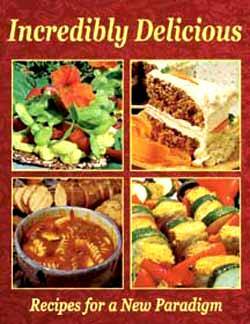 Heather Brook Le'amohala is a co-author of this over 500 vegan recipes cookbook.